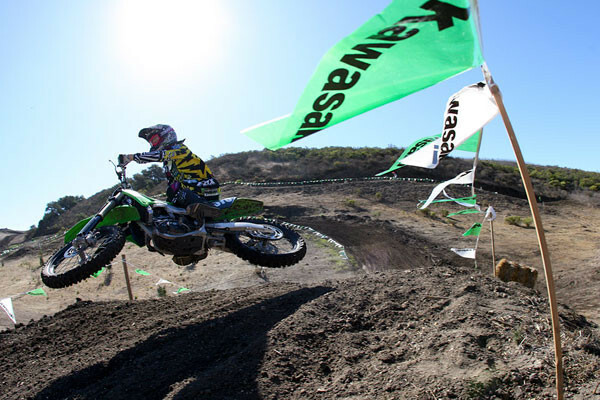 Blake Baggett wringing out the new 2010 Kawasaki KX250F at Castillo Ranch. Click any image in this article for a larger version. Click the following link for a video of Kawasaki's Greg Lasiewski, and Blake Baggett showing off the new 2010 Kawasaki KX250F. Oh, and there is a special cameo appearance from Jeff Emig as well. 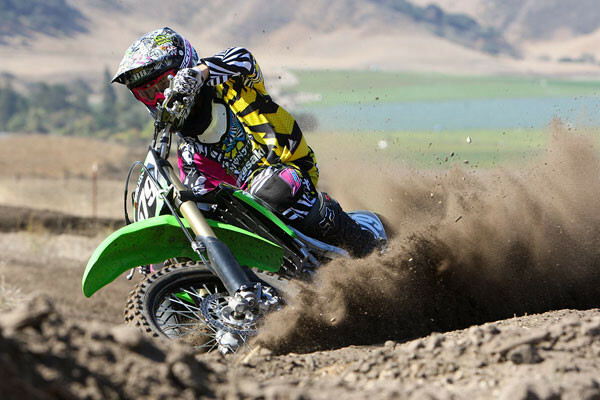 Click the following link for three different wallpapers (in two different sizes) of the 2010 Kawasaki KX250F. Yep, Christophe Pourcel scored a 250 East Supercross title on the ’09 edition of his Monster Energy Pro Circuit Kawasaki KX250F, and just missed on another title in the outdoor season. Obviously the bike was working well for him. For all the major upgrades that the 2009 Kawasaki KX250F received in its aluminum chassis and engine departments, we figured that on the new edition, the list of changes might be a little leaner. We were actually surprised at the number of updates to boost performance, durability, or both. Ready to jump in and run through the list? Here goes. Like its bigger brother, the KX450F, the 250F gets a new box structure piston with addition reinforcing ribs underneath to boost strength and power, as well as trimming weight. It also features a .6mm taller piston crown for improved combustion. Weight was also trimmed with a 7mm shorter wrist pin, and that translates to faster revving. The cylinder height was also changed by .5mm, (to accommodate the new piston and match its compression ratio), but the big news here is that the surface treatment of the cylinder wall has been changed from a plating to Electrofusion. Kawasaki claims that this results in improved oil retention on the surface, for less scorching, as well as better resistance to seizures. On the bottom end, there are changes to the crank, including a 1mm longer crank pin, a boost of 1mm on the width of the connecting rod and bearing, as well as a boost on the thickness of the copper plating on the small end of the rod. Your net benefit? A cooler-running engine, with added durability. The cam has also been revised, boosting the spring load set on the auto-decompressor. By holding the decompression on longer, it results in easier starting. In fact, we were able to regularly start the bike on the first or second kick, even while in gear, something that’s notoriously difficult to do on most 250Fs. The exhaust has been tapered from 35mm to 45mm diameter, with 10mm added to the 35mm section, and 10mm removed from the 45mm diameter section, to add better low-end performance. The material has also been changed from titanium, which is light but fragile when hot, to stainless steel. The muffler has a new shape for the pipe/muffler junction, a new clamp shape for better sealing, and a rubber-mounted design. They’ve also changed up the oil pump rotors, adding a half millimeter of width. While that may sound small, it’s said to result in a ten percent increase in oil flow, which is good news for a high-revving 250F. The scavenge pump rotor has been reduced in size slightly, to match the flow balance, and reduce resistance from mechanical loss. We heard reports from a rider or two of the front end pushing in areas like this silty berm, but overall, the handling got high marks. The cases have also been changed, with 2mm added to the thickness, as well as changing the case shape for the lower front engine mount. Another change found on the 2010 450F made its way to the new 250F, with radiators that are thicker (a full 10mm), wider (4mm), and with a boost in fin pitch and size. The goal was to provide larger and stronger radiators with improved torsion rigidity, as well as simplifying them (and reducing weight) by removing mounting brackets, and support stays. All the changes to the engine are said to durability, while also providing modest horsepower gains. The transmission has undergone some changes as well, removing a circlip and washer, changing the shape of the input gear for second gear, and boosting the durability of fourth gear. The dogs on third gear are also larger now, for better gear engagement, and added durability. Our test rider for the day at Kawasaki’s 250F intro, Blake Baggett, said this combined to make for a very noticeable change in shift performance. If you think the laundry list of changes for the engine and transmission was substantial, you’d better settle in, because Kawasaki’s got a lot more for the chassis. Up front, there are new Showa Twin-Chamber forks, which feature titanium-coated lower tubes, and a Kashima coating on the interior of the upper tubes for minimum friction and better fork action. Kawasaki’s the only company to do this in the 250 class. The fork is also equipped with different damping settings, for a better front/rear balance, less front end dive, and improved performance. Kawasaki also decreased the steering stem shaft diameter by a millimeter, in an effort to reduce rigidity, and boost front wheel tractability. In back, the Showa shock gets a new set of bold new damping settings, but the bigger changes are in the linkage, with a new pull rod and rocker arm. The goals of Kawasaki’s engineers here was to reduce kicking, improve rear wheel traction, and making the bike easy to corner. The swingarm itself is also new, with a revised shape to the cross-section, thinner wall thickness for both the exterior walls, as well as the interior ribs. Reducing rigidity here is said to provide a lighter handling feel, and better cornering. Close contact. When you're on a photo and video shoot with bikes and riders you're not comfortable with, you don't get this close. Blake was always under control. The wheels have a new cross-section, with a narrower width and more substantial depth, which is said to boost strength, while trimming weight. They also have a black finish to the Alumite wheels, and are the only Japanese 250 to do so. How about a few final changes? The rear brake features new pads with a different material and insulation, in an effort to improve rear brake feel. There’s also a new front fender with a thicker mounting area, and front, do prevent it from flexing too much. And finally, the seat features an improved shape, with a firmer urethane foam. We enlisted the services of new AMA Pro Blake Baggett to try out Kawasaki’s latest 250F, fresh from his fourth-place finish aboard his ‘09 Kawasaki KX250F in the final moto of the season at Steel City. Blake has been a longtime member of Team Green, and among the biggest items that he noted were similar handling, suspension, and power (remember, it’s been since the World Mini that he was aboard a stock bike). But he did notice big improvements in shifting, braking, and in the ability to start the bike…even while it was in gear. It’s definitely an improvement on the breed. For more of his comments, you can check out our video from Castillo Ranch (see the link above), and catch the full specs below. Rake / trail: 27.4 degrees / 4.7 in. Front suspension / wheel travel:	47mm inverted Showa twin-chamber telescopic fork with 16-way compression and rebound damping / 12.4 in. Rear suspension / wheel travel: UNI-TRAK® linkage system and Showa shock with 13-way low-speed and stepless high-speed compression damping, 17-way rebound damping and fully adjustable spring preload / 12.2 in.